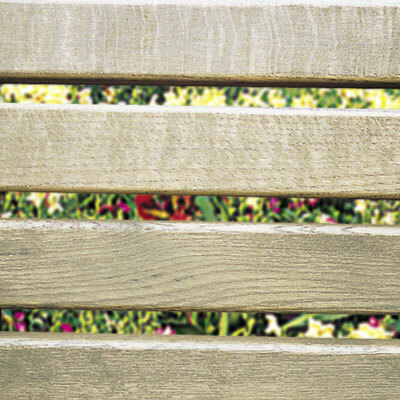 Streetmaster is an FSC and PEFC certified supplier. 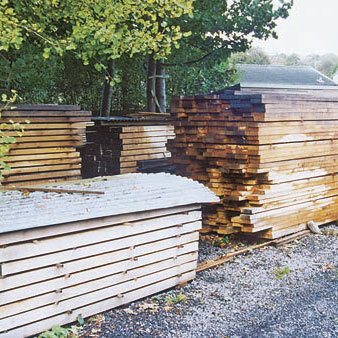 The main timber options we offer are iroko, European oak, American oak and treated softwood. We also supply products made from other hardwoods, but in very small volumes. 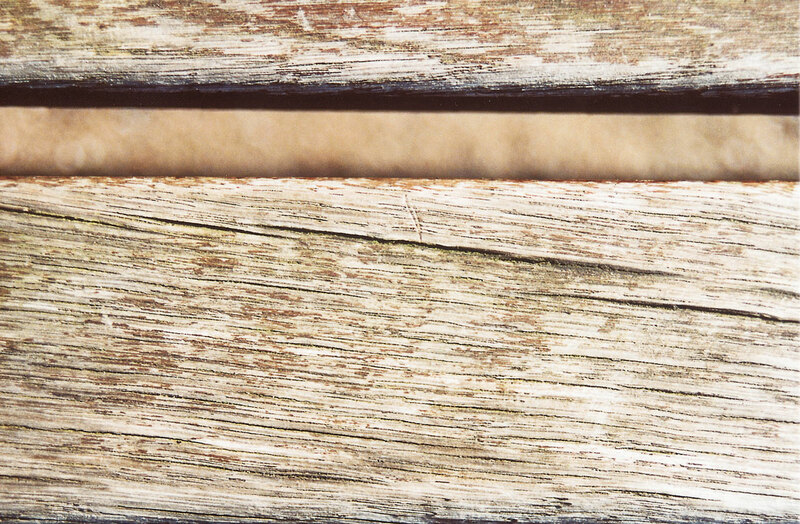 All of the European oak, American oak and treated softwood we purchase comes from either FSC or PEFC certified sources with chain of custody certification. The Forest Stewardship Council (FSC) and The Programme for the Endorsement of Forest Certification Council (PEFC) are both independent, non-governmental organisations whose purpose is to promote the responsible management of the world’s forests. This is achieved through a global forest certification system, the key elements of which are forest management and chain of custody certification. This ensures that timber produced in certified forests can be traced from the forest to the end user. 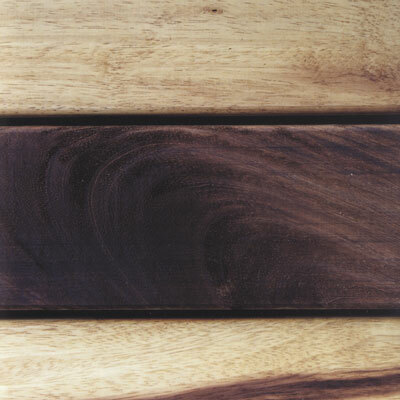 The iroko we use is not FSC or PEFC certified. It is sourced from well established producers in Ghana and the Ivory Coast. These countries have long had a policy of sustainable forestry management. We do not obtain supplies from South America, where large scale rain forest destruction is occurring. Iroko is classified by The Timber Research and Development Association (TRADA) as ‘very durable’, and is only used by us in kiln dried form. It is a stable weather resistant material, which has been used extensively in the manufacture of external furniture since about 1945. 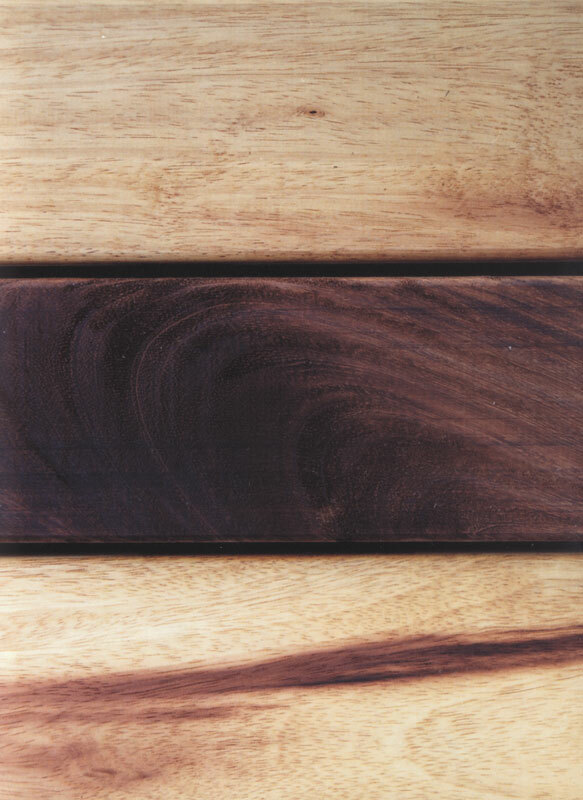 Iroko does not normally split, shake or surface check extensively, though small splits on end grain and surface checking can occur. Warping can also sometimes occur, particularly on the boards of our steel framed seats, which have relatively long unsupported sections. Wide colour variation, from light yellow to dark brown has become more common as producers seek to reduce waste. 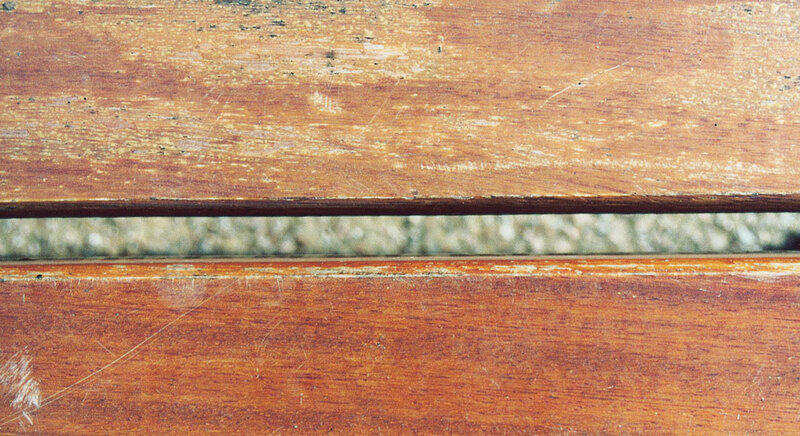 This colour variation can occur on a single piece of timber anywhere along its length, or as a difference between boards on the same seat. Very small white spots caused by mineral penetration as the tree is growing can sometimes be apparent. These spots cause no harm and become invisible as the seat ages. 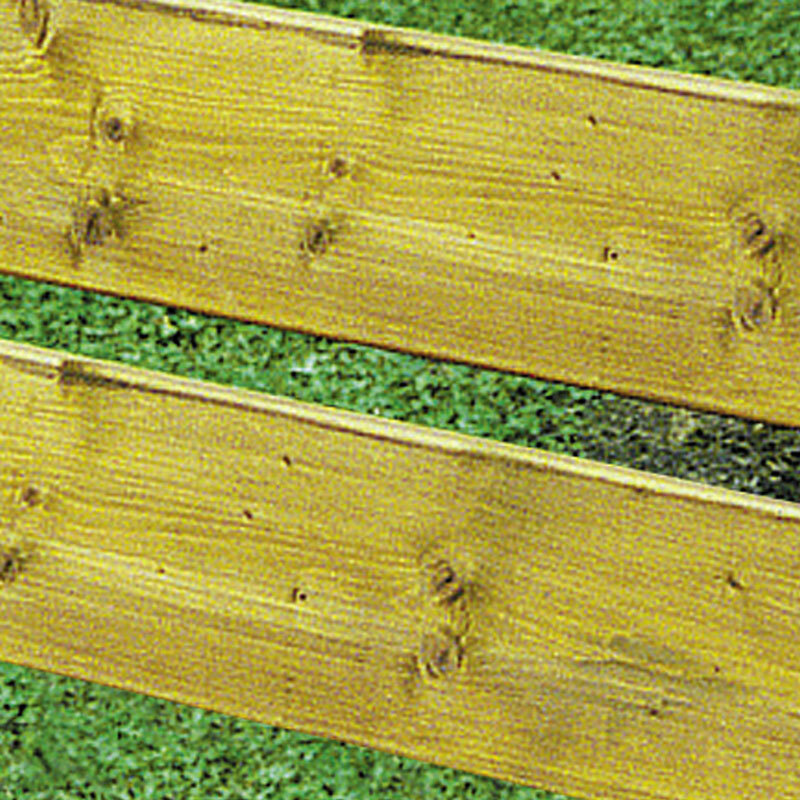 This timber is the commonly specified option for cast iron seats, traditional all-timber seats, steel framed seats, picnic furniture and litter bins. Iroko boarded cast iron seats, steel framed seats, picnic furniture and litter bins are finished with two coats of microporous Cuprinol exterior wood stain. The Cuprinol slowly degrades due to the action of ultra violet light and abrasion, and might be expected to require additional coats after 18 – 24 months. If this is not done the iroko will turn ash grey in colour. 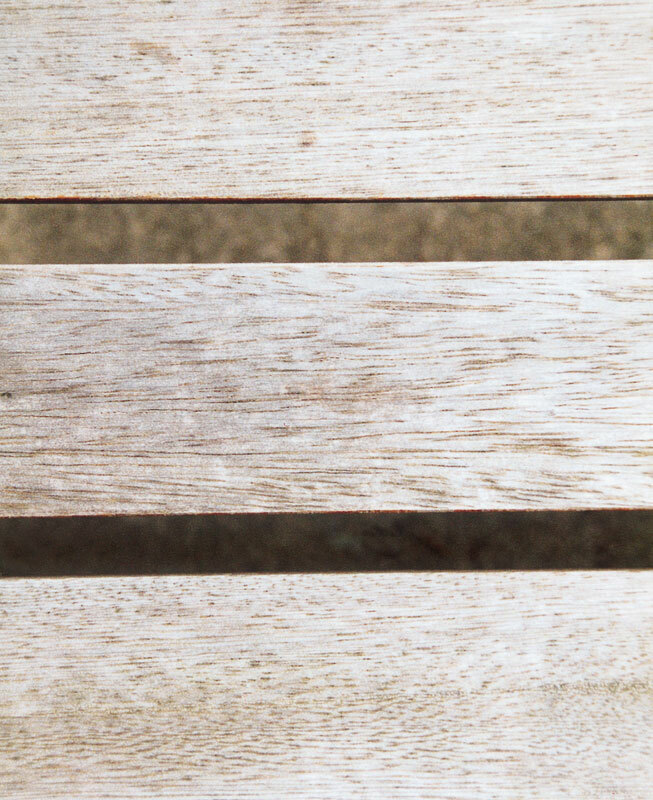 The iroko seats in our Traditional range are planed and sanded as standard, and have the timber graded to help reduce the degree of colour variation. To enhance their appearance, and to give them a more even colour, they can be finished in a dark oak coloured spirit based wood stain, if required. 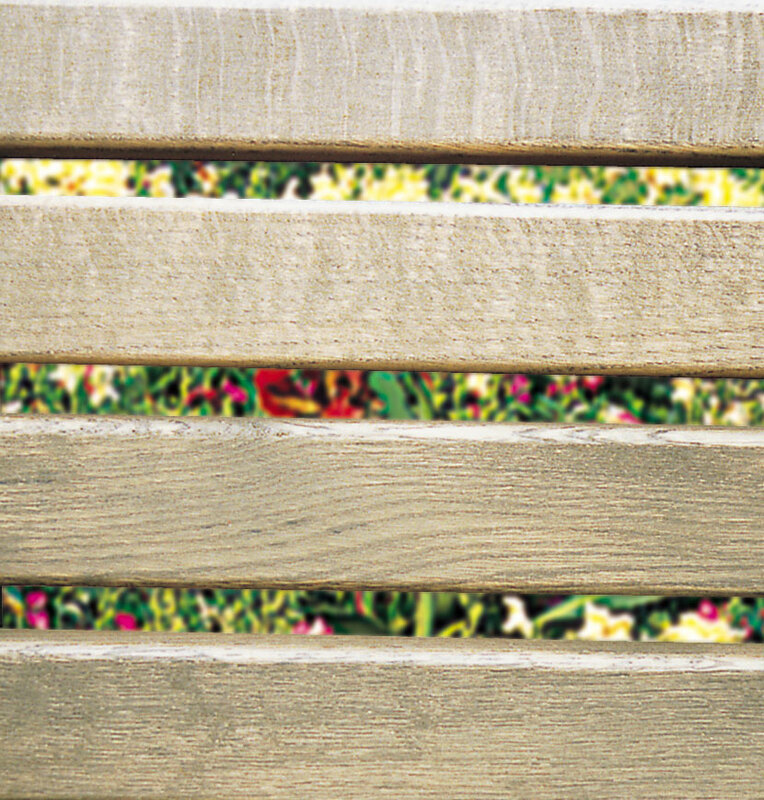 The wood stain enhances the appearance of these seats only for the first few months after installation, and will fade due its exposure to sunlight and rain. If left untreated most of the wood stain will have disappeared after about 12 months and the seat will then be a light ash grey colour. It will remain this colour if left untreated. If the condition of the seats is reviewed at six monthly intervals and wood stain applied, this will help to maintain the original colour the seat had when it was delivered. 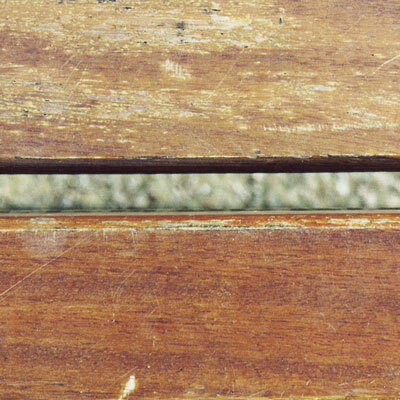 We source this wood from FSC and PEFC certified sources in France and Germany. We currently buy 10% from France, with the balance coming from Germany. The proportion we source from each country varies each year and depends upon availability and price. The felling of trees in each of these countries is strictly controlled by the relevant government departments. In both France and Germany the growing of oak for commercial purposes is very established, and has always been controlled and licensed. 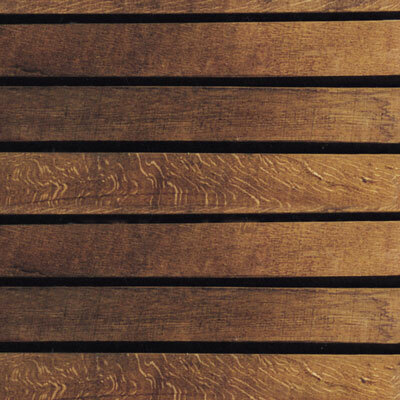 Seasoned European oak is classified by TRADA as ‘durable’, and has been used externally for centuries. We almost always purchase it green, and air and kiln dry it ourselves to obtain a reasonable moisture gradient, and the correct moisture level of between 19% and 21% ( plus or minus 3%). These two factors are the key to maximizing stability. It has more knots than either iroko or American oak, and has a tendency to surface check, split, shake and warp, particularly on the larger sections of timber. 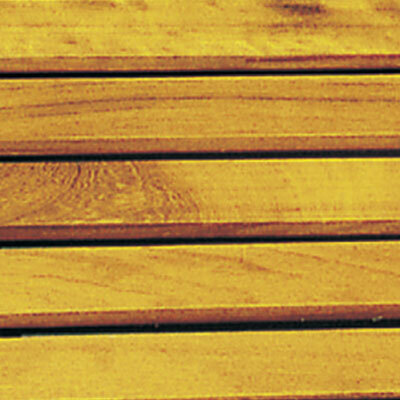 These characteristics are an inherent quality of this timber, and are beyond our control. 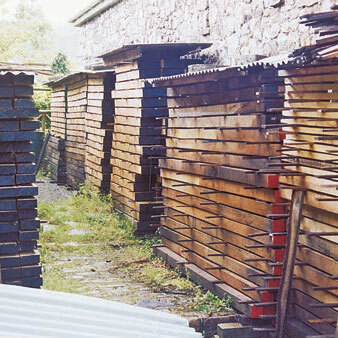 We have invested heavily in this wood, and have more than a hundred tons air drying. 80mm thick sections take about three to four years to dry. Cast iron seats, traditional all-timber seats, steel framed seats, picnic furniture and litter bins can all be specified with this timber, at additional cost. The variability in the surface consistency and tendency to movement can effect the adhesion of high build surface finishes. We do not recommend the application of any high build finish to seasoned European oak. We finish seasoned European oak in a dark oak coloured spirit based wood stain, which cannot lift or peel. 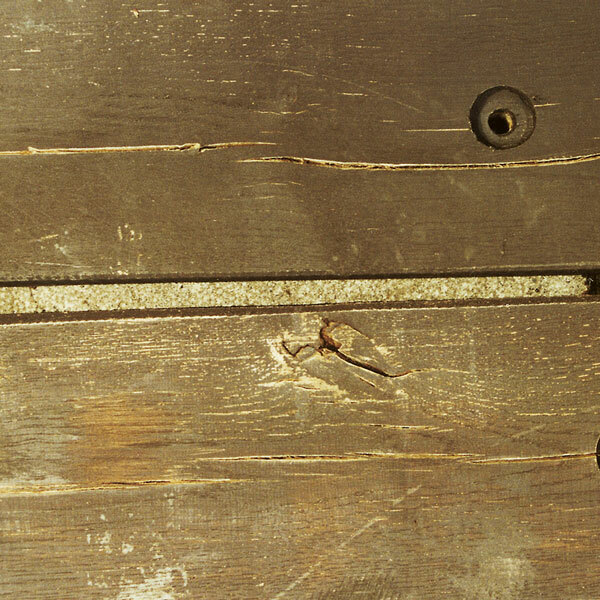 The condition of seats and picnic units should be reviewed after approximately six months, and any areas of raised grain briefly sanded down with fine sandpaper. If the units are re-stained at this stage it will improve their appearance. If the finish is not maintained oak will turn ash grey in colour. We use this material for the Woodland range, some of the items in the Junior range, and some other items. 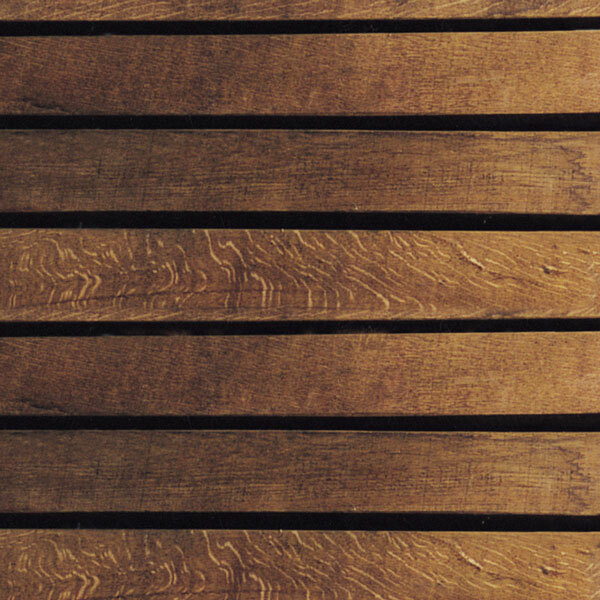 We finish green European oak in a dark oak coloured spirit based wood stain, which cannot lift or peel and which conceals the black marking this material is prone to, if left untreated. 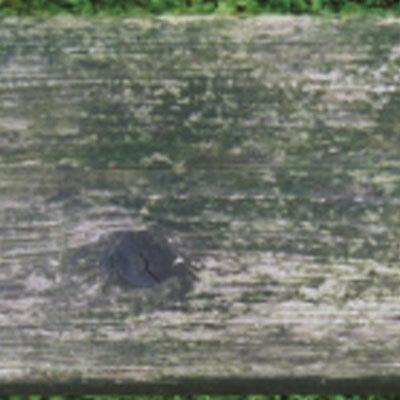 The condition of seats and picnic units should be reviewed after approximately twelve to sixteen weeks, and their top surfaces briefly sanded down with coarse sandpaper, and any sharp protrusions removed with a trimming knife. If the units are re-stained at this stage it will considerably improve their appearance. 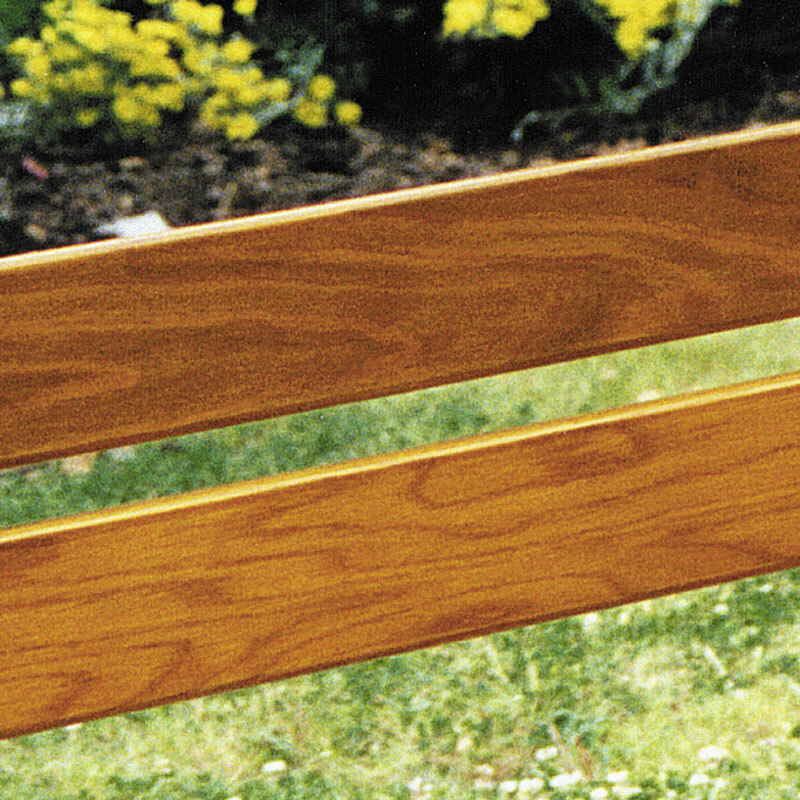 We supply 500ml of stain free with every seat or bench delivered (1000ml with a picnic unit), to enable this work to be done. If the finish is not maintained oak will turn ash grey in colour. American oak is sourced from the eastern states of North America, and all the timber we buy is FSC certified. The felling of this timber is carefully controlled by the American government, who have had environmental legislation in place for more than nine decades. American oak is classified by TRADA as ‘durable’ and has been used for internal and external purposes for a great many years. It is not quite as durable as seasoned European oak. It is stable, virtually knot free, and kiln dried. It has some tendency to surface check, shake and split, though these effects are not normally widespread. Cast iron seats, steel framed seats, Universal Bench System, picnic furniture and litter bins can all be specified with this timber, at additional cost. We finish American oak in three coats of microporous Cuprinol exterior wood stain. 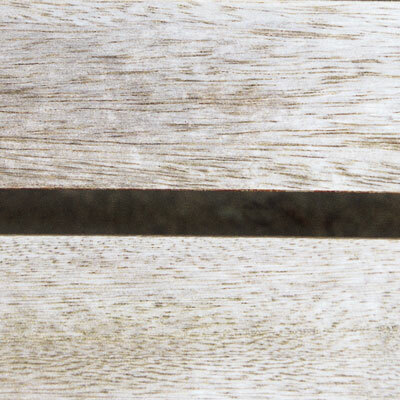 Because of the possibility of movement, particularly surface checking, the adhesion of the surface finish can sometimes be effected, generally on small areas of timber. 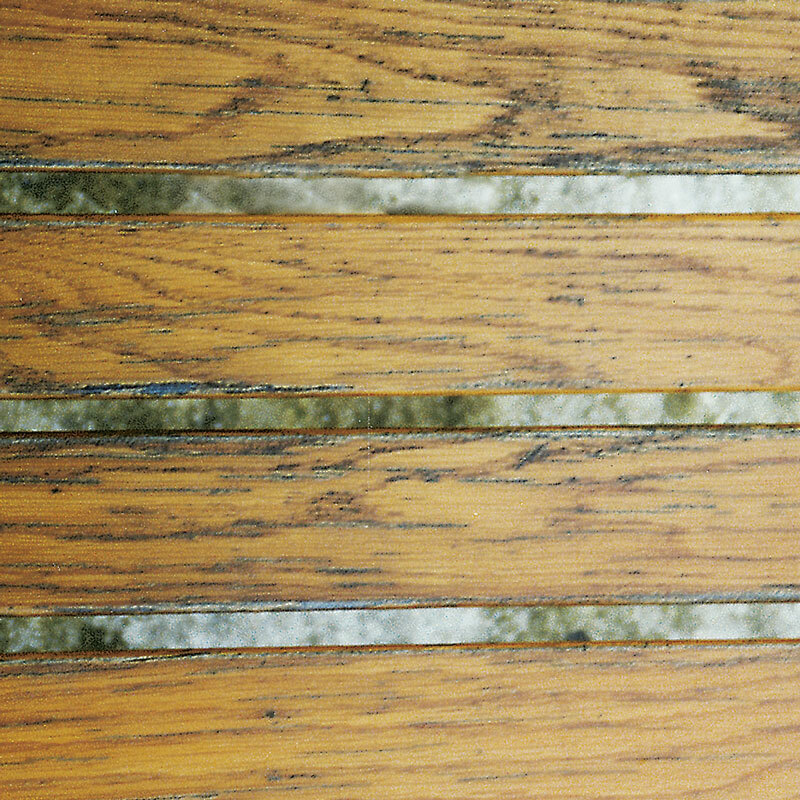 The Cuprinol slowly degrades due to the action of ultra violet light and abrasion, and might be expected to require additional coats after 18 – 24 months. The finish on American oak should be maintained to increase its life span. If the finish is not maintained American oak will turn ash grey in colour. All our treated softwood is from FSC and PEFC certified sources in Scandinavia and Eastern Europe. Because it is so fast growing the environmental issues concerning the use of this material are very different to hardwood environmental issues. Most countries that grow softwood, and all the countries we buy it from, have a steadily increasing amount of land given over to softwood production, which is, in effect farmed and harvested like any other crop. Treated softwood used for the Woodland Range, Robin Hood bench, Cinderella seat and Pied Piper picnic unit, which is in contact with the ground, is sent for CCA treatment after we have cut and machined the components, so that all the final surfaces and end grain are properly protected. Timber used for the Goldilocks seat, Suffolk bench, Aladdin bench and Peter Pan picnic unit that is not in contact with the ground, is Vacsol Aqua treated. Though not as durable as our hardwood options, both of these treatments enable the timber to last well in external environments. All Vacsol Aqua treated softwood we supply has been kiln dried before treatment, CCA treated softwood has not been kiln dried. 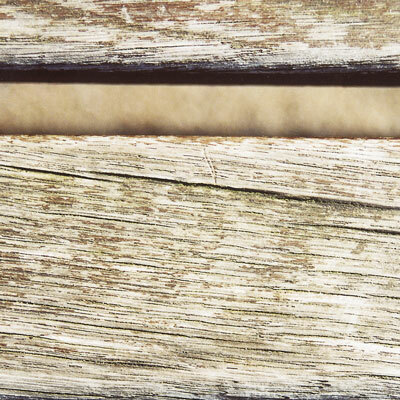 Softwood is very susceptible to seasonal shrinkage and expansion when used externally. 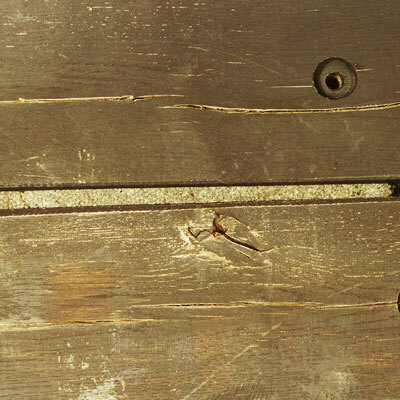 As a result, some splitting, cracking and warping will occur on products made from this material. Treated softwood is an option for Woodland seats and picnic furniture, an option for some items in the Junior Range, and is used as standard for the Suffolk bench. We finish the Woodland Range products, Robin Hood bench, Cinderella seat and Pied Piper picnic unit in a dark oak coloured spirit based wood stain. The Suffolk bench, Goldilocks seat, Aladdin bench and Peter Pan picnic unit with brown boards are finished in a dark oak coloured spirit based wood stain. The Goldilocks seat, Aladdin bench and Peter Pan picnic unit specified with blue, yellow, red or green boards are finished in Cuprinol Premier wood stain. 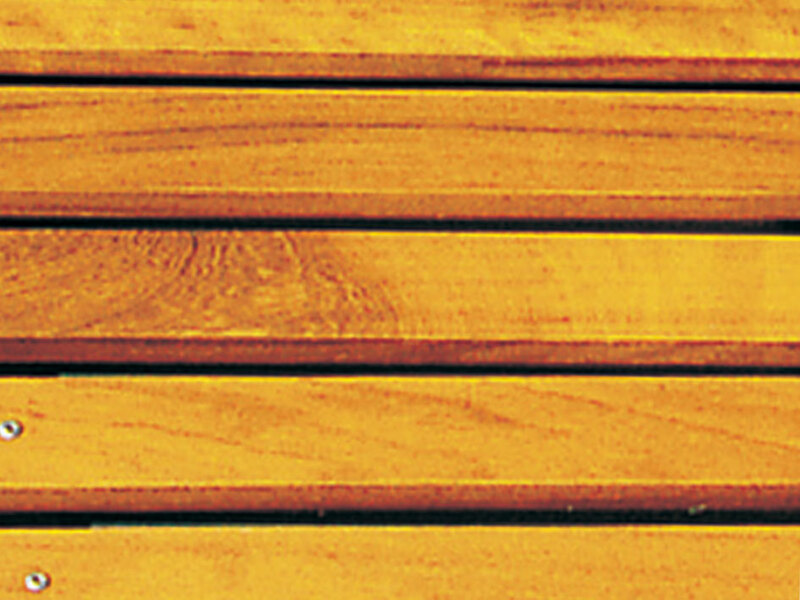 Treated softwood might be expected to require additional coats after 18 – 24 months. 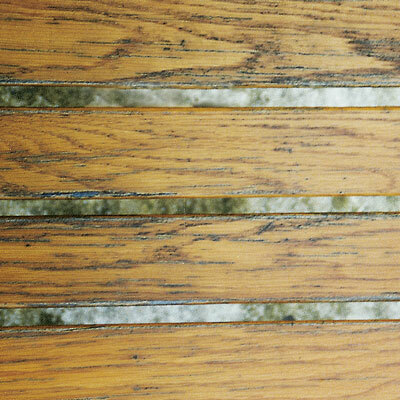 If these finishes are not maintained treated softwood will turn ash grey in colour. Due to unpredictable issues in international timber supply, it may be necessary to supply a substitute timber to that originally specified. The substitute timber would always be of equal or superior quality and environmental credentials. Whilst every effort has been made to make the dimensions and weights stated for each product as accurate as possible, these are only approximate. Weights especially are prone to variation, particularly with products made from European oak.